SwordClassic example of the Shinshinto Yokoyama Bizen group. Because the work is composed of beautiful Kobushigata choji-ba, many times these blades are mistaken for works of Naka Kawachi Kunisuke. 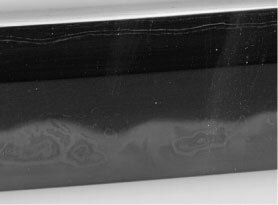 However, if one notices the structure of the jigane, one should notice both the extremely tight ko-mokume hada, but yet noticing the presence of very apparent O-hada in the pattern. Yokoyama Sukekane was the adopted son of Yokoyama Sukemori, and was trained by the famous Yokoyama Sukenaga of the Shinshinto Bizen School. Sukenaga inscribed on the tang of his swords “ Tomonari GojuRoku-Dai Mago” meaning that he was the 56th generation descendent of the Tomonari Bizen tradition. Sukekane followed in this tradition by inscribing that he was the 58th generation of the line. The first generation of Sukekane is rated as “Chujo-saku” and is well accepted in the world of collectors due to the fact of the beautiful Choji midare that he reproduced so well. Suguha is also seen from this Toko, and is similar in the style from the Oei-Mid Muromachi jidai. The second generation Sukekane is listed as a “chu-saku” class smith and carried on the tradition until the banning of wearing the sword edict came into effect during the early Meiji jidai. Ustushi-mono (reproductions) of the older late Koto Bizen-den, as well as the Shinto Kunisuke group are quite common from all members of the Yokoyama tradition, thus making their swords good targets to make “forgeries” of more older famous makers. This sword has been certified by the NTHK as genuine.